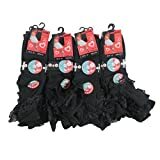 12 Pairs of Girl’s frilly lace socks in solid black colour and solid White the socks are ideal for girls and older girl sizes. The socks are made from soft cotton offering further comfort when worn. The socks are available in plain black and plain White they have the lace at the top of the socks so they are visible when worn. These socks are ideal for school wear or just to look smart everyday or special occasions. Please note this item is from the IMTD brand which is exclusive to us.